"A Beauty Review: Auolive’s Rise & Shine, Moisturise! Tired of your tediously labyrinthine skincare routine flooded with a myriad of products and interminable steps? Auolive has got you covered. Lavish your face with their lightweight water-based formula of the Rise & Shine, Moisturise! Day Glower. This moisturiser-sunscreen will grant your skin deep hydration and sturdy protection from brutal UV rays, leaving you with a luminous and smooth complexion. The star ingredient? Gingko Biloba Leaf Extract. It is heralded for its antioxidant and anti-inflammatory properties, and boosts collagen formation as well as strengthens capillaries to revitalise and firm the skin. Blending that with other luxurious natural ingredients such as the wrinkle-defeating Squalene, this anti-pollution moisturiser-sunscreen effectively battles environmental aggressors and protects your skin from harsh sun damage. Its perfect dewy finish allows it to triple up as an impeccable makeup primer. Every morning, before I leave the house, it is inherent that I moisturise my face and apply sunscreen. This often leaves my skin feeling like an oleaginous canvas, until my skin fully soaks up the double layers of lotion. But, thanks to Auolive, I’m no longer plagued by that problem. With their incredibly formulated Day Glower, my moisturiser and sunscreen are melded seamlessly into a single sleek product, saving me time and effort. The formula itself is light and sheer, promising to exterminate the cloying feeling my skin had always experienced previously. After application, I’m left with a smooth complexion that’s ready to take on the sun. My skin feels slightly dewy, which makes it the perfect base for whatever makeup I throw on. I was surprised to see how obediently my makeup stayed on the whole day. Amazingly, not once did my skin feel oily at all throughout the entire day. 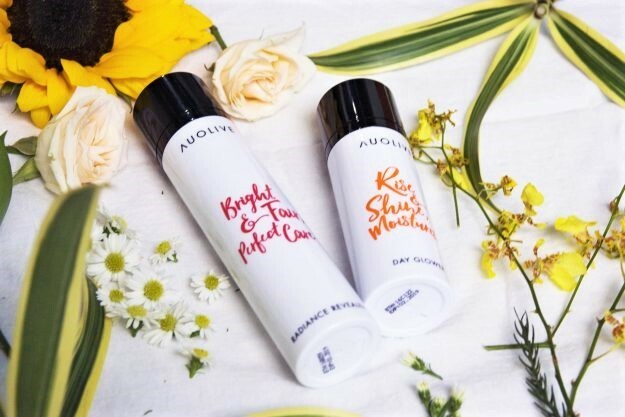 If you’re looking for a 2-in-1 moisturiser and sunscreen that will simplify your skincare routine into a fuss-free and efficient process, look no further – Auolive’s Rise & Shine, Moisturise! Day Glower is the one for you.